We awoke to a glorious sunrise in Williams, AZ. On our last blog I think I led you to believe the city of Williams was only 4 blocks long. Only the downtown area was 4 blocks long. The city of Williams is large in land mass. We spent most of the day just traveling. We stopped in Gallup NM to have lunch in the Hilton. What beautiful scenery we had. Even though it was close to the highway it was still peaceful. Even though the picture does not show it there were sheep grazing in the meadow. As we left Albuquerque, NM we could see storm clouds ahead. I was fascinated with clouds because we almost never see our rain coming toward us like that. Well, rain is a foreign word with Cally right now. It really did not rain hard and the highway was dry as fast as it dropped. Just as we were coming into Santa Rosa, (not our Cally city) we noticed what looked like a rainbow sticking out above the mountain. As we got out closer we could only see a faint line. This was reassuring as God's message is still there letting us know we always reafirrms His words to us that the whole world would like flood again. We ended the day with a beautiful sunset and a dinner at Denny's. Before I go just have one question to ask. Have you ever been suckered in on the grab machine? 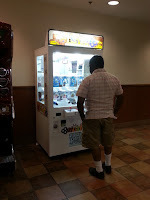 We saw people plunking yes I mean plunking their dollars on trying to get that dumb stuffed animal or the iphone from the vending machine. At least Denny's gave an option to buy one straight out. I think we all have been there done that. Let me hear your story. We retired to our Flying J hotel for the night. 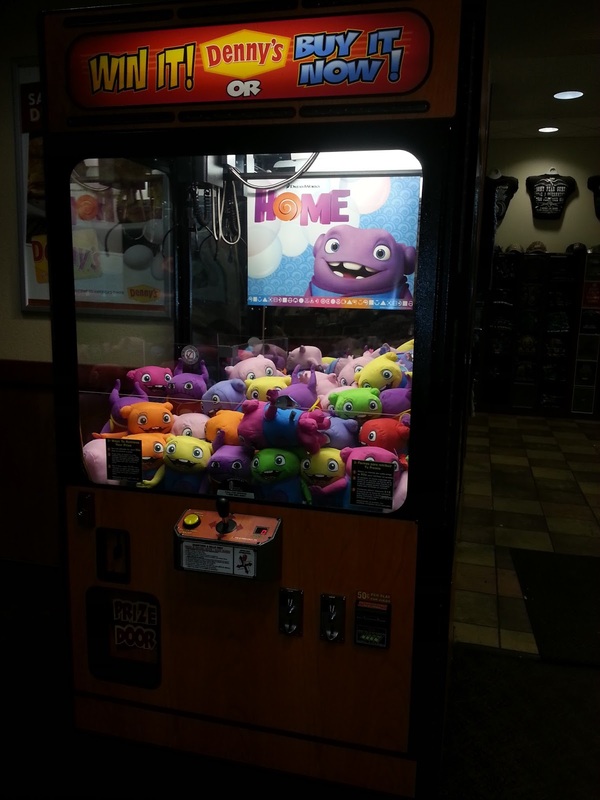 I always think of Toy Story when I see those grab machines, and the little aliens that called it "The Claw!" I always tried to get bouncing balls or gum balls and stickers out of those things, but I always got cheapie plastic rings or fake tattoos. Boo.